Stuart Lancaster's coaching credentials may be under scrutiny in the run-up to England's crucial World Cup match with Australia on Saturday, but despite a disappointing home defeat by Wales, the England boss still has total support in one part of Yorkshire. For the national side are not the only team Lancaster is responsible for - and at West Park Leeds Under-15s, they have no doubts over his ability. "The club gets behind him," said U15s co-coach Graham Chadwick. "It is not just England. It is Stuart. Our guy." Such loyalty will be welcomed before a game England will almost certainly need to win if they are to stand any chance of reaching the quarter-finals. But it is only to be expected given the length of time Lancaster has been involved with the community club. How did England coach end up at West Park? A decade ago, Lancaster was working for Leeds Carnegie and looking for a club where his then five-year-old son, Daniel, could play mini rugby. He had already got to know Chadwick through former Leeds team-mate Wayne Hartley, so took Daniel to West Park. "Stuart would always help when he could," said Chadwick. "He was a great asset to have, even when he was at Leeds. "We don't really see him as the England coach. 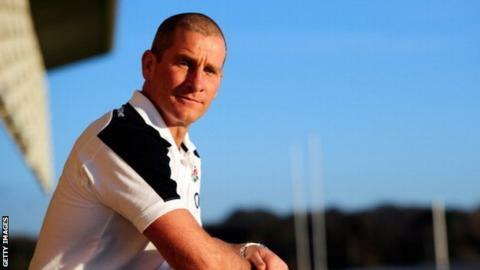 To the lads he is just Stuart Lancaster, the dad, the parent and the friend. It tends to be the opposition who make a big deal about it. "I have had opposition coaches tell me their lads are giving it an extra 10% when they play against us." England demands mean Lancaster is not an ever-present on the touchline at West Park. His time commitment is not insignificant, however. It is not unheard of for Lancaster to head up the M1 hours after Six Nations games to watch his 'other' team, even though the responsibility for them is not solely his. "We have a coaching team," said Chadwick. "A couple of dads help out in addition to Stuart. We are all in it together. "We always ask for Stuart's input but we don't defer and say 'Stuart over to you'. We will all say our piece and Stuart will add anything we might have missed." If Lancaster does not quite favour the 'hair-dryer' treatment for which Sir Alex Ferguson - manager of Manchester United for 26 years - is famed, he does demand the same high standards he expects of the national side in one respect. "I have seen Stuart lose his temper with the team," said Chadwick. "It was when the guys were moaning about the referee, talking back to him and not showing that true spirit and sportsmanship - the core values that rugby is founded on. "That is the only time I have seen him lose it. The rest of the time he is positive, gives encouragement and focuses on what we do as a team." How does he handle the attention? Rugby is famous for its social side. But in the professional era, when the pressure is intense and the media scrutiny high, Lancaster could be forgiven for keeping a low profile. He does go out in public though. And takes the inevitable attention in his stride. "I think it is a release for him to come down here in a no-pressure environment, wanting to do his best for a community rugby club," said Chadwick. "He just has the game at heart. "Opposition players and coaches are always wanting pictures and autographs. He might spend two hours doing it. "Other times he gets left alone. That is when he can sit down with us, have his sausage and chips and a can of Coke and just chat about everyday things like all the other dads." Why is it going wrong for English clubs in Europe? Read more on Why is it going wrong for English clubs in Europe?